Due to an unfortunate circumstance, I had to fly up to New York for the weekend. On the way to my very early flight out of Orlando International Airport, I stopped at this Dunkin Donuts in Longwood, FL at 6:00 am. I had a sesame bagel with smoked salmon cream cheese. Watch Me Eat turns one year old today. It all started last April 29 when I created this blog by posting a picture of my food from Red Lobster. I didn't quite have a goal for the Watch Me Eat, and I figured I'd keep on posting until I got bored with it. So far, I haven't gotten bored yet! There was one excursion out of the United States over the past year which took Watch Me Eat into International waters and eventually to the Bahamas. I was over at UCF and got hungry so I stopped by a relatively new restaurant that opened at the school called Salsa2go. It's an outdoor snack bar type restaurant that specializes in Mexican food. I ordered a chicken burrito on a chipotle flavored tortilla. The burrito was filled with chicken, lettuce, and jalapenos. I would have liked to try the homemade salsa that this place apparently makes but none was offered. Salsa2go should really have a list of the burrito toppings that are available on their menu. The burrito itself was good but for some reason it reminded me of food served at sporting events. I couldn't quite place why this was, but the burrito had more of a high school concession stand feel than a Mexican restaurant feel. Not to say this was a bad thing though. Like I said, the burrito was tasty. The chicken had a nice flavor and the jalapenos added some spice. Besides from not trying the salsa, I had no complaints about this burrito. I ventured into the scary world of Chinese Buffets and ate at King Buffet in Apopka, FL. As far as Chinese buffets go, this place was average. Lots of food, most of it a bit overcooked with the same overall taste. I ate at Captain D's in Sanford, FL. As far as fast food seafood chains go, Captain D's surpasses Long John Silver's or Arthur Treacher's Fish and Chips, but it still can be disappointing. The one thing that sets Captain D's apart from the other major chains is their alternatives to the normal deep fried fish. Captain D's has a rather large selection of non-fried seafood, and that's what I ate on this visit. Walking into the restaurant, I saw the poster in the window advertising their Big Easy Shrimp & Salmon Platter. It looked good, so that's what I ordered. The actual food served didn't look exactly like the picture. I ordered fries and a salad for the two sides. The shrimp were much smaller that what was shown. The salmon was overcooked and chewy. The salad was a bit wilted, but I have had much worse from fast food restaurants in the past. Once again, I ate at Bayridge Sushi in Longwood, FL. I ordered a Hibachi Chicken Lunch Bento for $7.95, which started with miso soup and salad. The soup and salad were followed by the bento, filled with the chicken, dumplings, rice, California rolls, and pineapple. You really can't go wrong with one of these bento boxes. 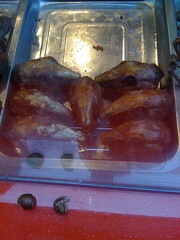 They come with a huge amount of food that is typically always good for a great price. I ate at the Outback Steakhouse in Altamonte Springs, FL. It's been years since my last visit to an Outback so I really didn't know what to expect. The dining experience started out with a wait. I had called ahead to make reservations, and Outback said the wait time would be cut in half. We got there and were given a buzzer. After about a half hour of waiting, it turned out that our buzzer never went off, so we had to wait even longer. They said we were probably out of range, but if that's the case, then Outback needs a new system because we were right outside of the front door, probably twenty feet from the receiver. We finally sat down, and I wasn't impressed with the menu. I don't really like steak, and the non-steak choices are very limited at Outback. I ended up ordering the Shrimp en Fuego. After a long wait, the food finally was served and I wasn't exactly pleased with my shrimp. They were deep fried, and the way the menu and the waitress described the dish put a different image of the shrimp in my head. Once I got over the deep fried part, the shrimp weren't all that bad. They were covered in a spicy buffalo wing type sauce, and served in a cheese covered potato skin of all things. A side of green beans were served on the side. I was visiting someone at ORMC and got hungry. I ventured down to the hospital cafeteria called the Kuhl Cafe. I had a wrap filled with fried eggplant, feta cheese, olives, spinach, and hummus, all inside of a spinach tortilla. Hospital food tends to have a bad reputation, but this wrap was really good! I had a coupon for a free ten inch pizza from Riverwalk Pizza in Sanford, FL. I wasn't expecting much, especially for free, but the pizza was really good. It had a nice and thin crispy crust. I liked the sauce and it was well proportioned to the cheese. I think I'll definitely have to return to Riverwalk and get another pizza! One thing I don't really get about the restaurant is it's building. The building is on the water in the middle of the Monroe Harbour Marina, and yet whoever designed the building made it so you don't have a view of the river from most of the restaurant's windows. Instead, you see the Senior Citizens Center across the street. I'm assuming the building was intended for restaurants when it was built (it originally opened with a Dalli's Pizza). People seem to like restaurants with views of water, so I don't really get why this building's architect choose not to make the St. Johns a focal point. I stopped in Little Vietnam in Orlando, FL. The plan was to eat lunch, probably at Viet Garden, but I got distracted by the sign in Lollicup's window. I've had boba tea from Lollicup several times in the past, and when I noticed this location now served food I decided to give it a try. I started with the obligatory overpriced boba drink. I had a Papaya Avocado smoothie with boba. It was good, although I think they may have added lots of extra sweetener to the drink. There were huge jugs of fructose under the counter, so I'm assuming those go into the drinks. A fruit smoothie is sweet enough as it is and the boba makes it sweeter. There's no need to add additional sweetener on top of that. 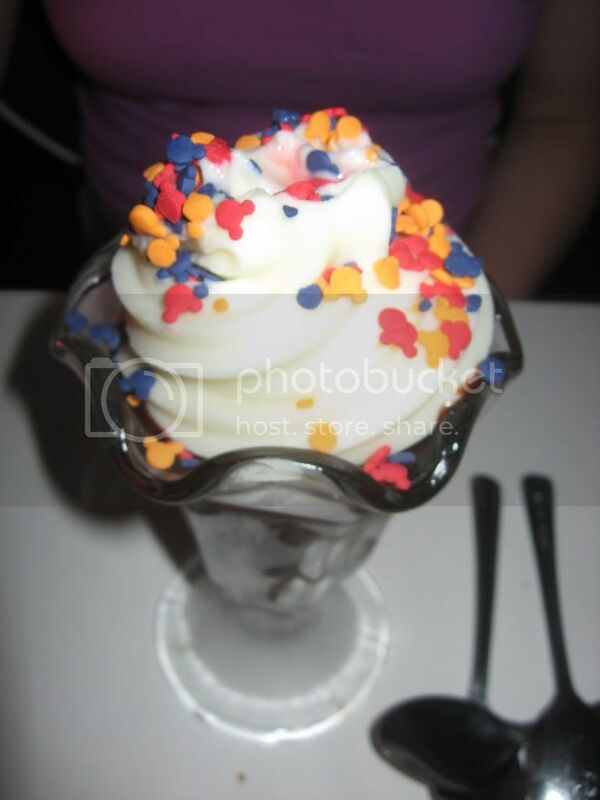 It was almost $5 for a small drink, but a dessert elsewhere would most likely also be about the same price. I've found that smoothies are definitely the way to go at Lollicup. All of the tea drinks remind me of a bottle of Orbitz with way too much ice (although I did love that stuff). Moving on the the food, a Summer Roll was ordered. Sort of like the healthier Vietnamese version of a Chinese egg roll, the summer roll consisted of shrimp, pork, cilantro, cucumbers, and vermicelli, all wrapped in rice paper. Peanut sauce was served on the side. I love how the rice paper is somewhat translucent so you can see the brightly colored contents of the roll. I have heard of Vietnamese Subs, or Bánh mì, but have never tried one. The sandwich consisted French bread stuffed with sliced pork, cucumbers, onions, cilantro, jalapeno peppers, assorted pickled vegetables, and possibly more toppings that I'm overlooking. I was really impressed with the sandwich. It reminded me somewhat of a Cuban sandwich with the pork and pickles, only improved with the rest of the toppings. This good sized sandwich was only $2.50. That's less than a Boba drink! For a bit of an update, Lollicup no longer serves food and are back to only serving beverages. It's unfortunate, especially since I haven't found a better summer roll elsewhere in Orlando! 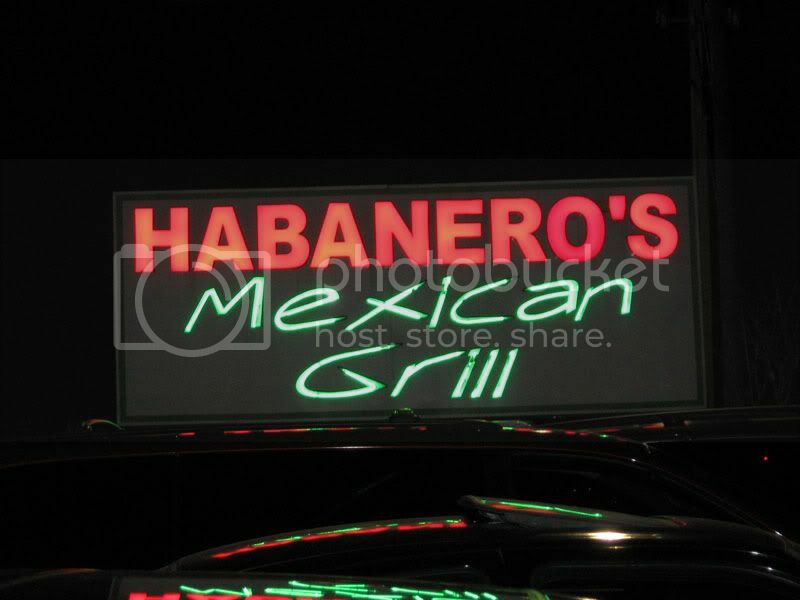 I ate at Habanero's Mexican Grill in Casselberry, FL. The meal started with chips and salsa. I liked how they gave everyone their own individual bowl of salsa with a pitcher of salsa on the table for refills. This way, each person at the table could double dip to their hearts content. For my dinner, I ordered the Enchiladas Supreme. This included four enchiladas, each with a different filling. One was filled with refried beans, another was cheese, the third was beef, and the final enchilada was filled with shredded chicken and peppers. 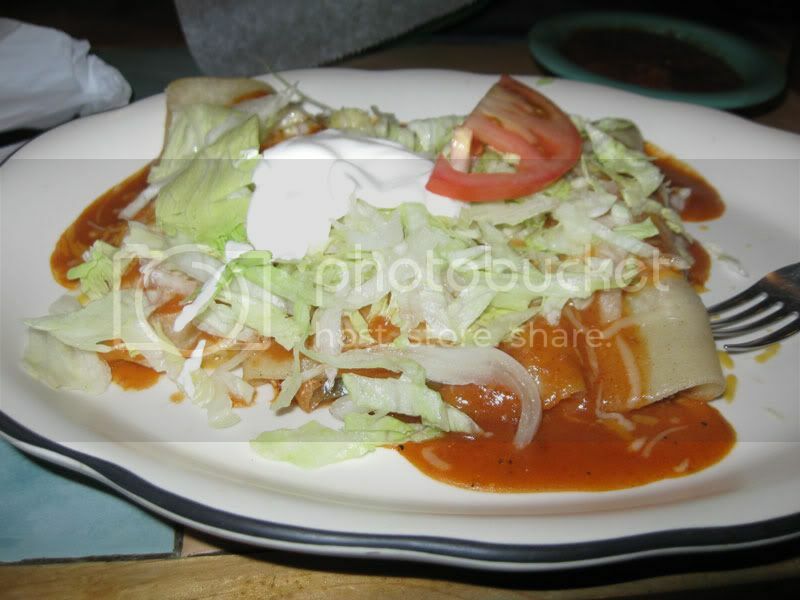 The four enchiladas were topped with sauce, lettuce, tomato, and sour cream. I could have done without the beef enchilada, but I liked the other three. My only complaint was that it would have been nice if they served the enchiladas with a side of rice or beans like other Mexican restaurants often do. I ate at Dexter's in the Thornton Park neighborhood of Downtown Orlando. Apparently the building was one of the original Publix Supermarkets. I had a Cajun Hoagie. It consisted of turkey, andouille sausage, lettuce, tomato, cheese, and a mayonnaise type sauce, all in between pressed French bread. Kettle chips were served on the side. It was good, although if I didn't have good teeth, I would have probably had problems eating the very crusty bread. I had always heard Dexter's had high prices, but with my sandwich costing $7, it really wasn't bad.